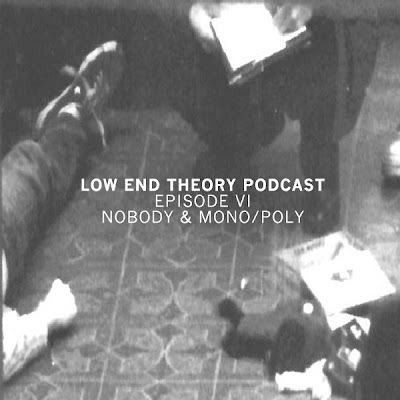 I can post Low End Theory Podcasts to my blog without first listening to them. I simply KNOW that my expectations will be fulfilled. This is exactly the case with installment no. 6 in this extremely original series pushing the boundaries of music experience further and further. Besides, I'm a big fan of West Coast sound and Mono/Poly is definitely one of the most interesting representatives of this 'movement'. His sound collages and solid beats are so diverse and fluid, full of glitches and distortions and he switches smoothly between whompy midtempo songs and bleeps and beeps of electronic improvisation and a bit suprisingly he started his set with properly heavy dubstep (I LIKE)!! An artist you should definitely check and momorize. Of course, Nobody's set is pure quality as usual ranging from glitch hop and heavy bass extravanganza to lazer synths, stomping drops and kicks to reach its port of destination in neon-light coolness. Well, let's not waste time on reading, just listen to this piece of wonderful music.